Wiper party leader Kalonzo Musyoka who is facing rebellion in his hometurf is reportedly set to embark on a mission to galvanise his Kamba vote bloc ahead of what is said to be an earthshaking deal with Jubilee. 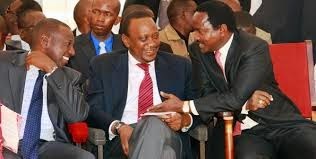 Those in the know say that for some time now, Kalonzo has been making overtures to Uhuru Kenyatta with a view to be incorporated in the government. Kalonzo’s Okoa Kenya movement which he is pushing with Raila Odinga and Moses Wetang’ula is facing stiff resistance in Ukambani and it is this hardship that Jubilee is reportedly keen to capitalise on. 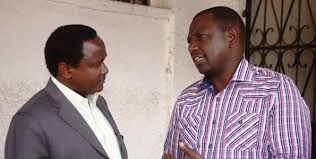 Even without the referendum hitches Kalonzo is facing, Jubilee has been working on a scheme to whittle Kalonzo’s influence in Ukambani and then dangle a carrot in the shape of a plum government position. It is said Kalonzo will for starters replace Dalmas Otieno as Uhuru’s special envoy in the Great Lakes region that also brings on board Southern Sudan as warm up to bigger things. Kalonzo has served as a Foreign Affairs minister and it is understood he has been secretly pining for a call from State House appointing him an ambassador. He is the consul of Government of Cyprus in Nairobi. To further compromise Kalonzo into playing ball, Jubilee wants to fast track a Bill that proposes sumptuous retirement benefits for Raila and Kalonzo. The former prime minister and former vice president will be entitled to monthly pensions equal to 80pc of their last monthly salary in office. 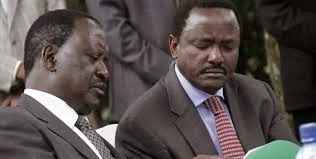 The offer is too good to resist to even Raila who unlike Kalonzo has become extremely wealthy ever since he was himself compromised by Daniel Moi and made minister of Energy in the dying years of Kanu. According to the Retirement Benefits Bill envisaged, Raila and Kalonzo will get Sh800,000 each month, in addition to two saloon cars of not more than 2,000cc each. Each of the former leaders will also be entitled to a four-wheel-drive vehicle of not more than 3,000cc, with 15pc of their former monthly salaries as fuel allowance. Some MPs have been against it and have made a number of proposed amendments to reduce the packages, which they term as luxury. Others wanted to allow Raila and Kalonzo to continue being active in politics even as the state continues to provide them with retirement benefits. Suba MP John Mbadi had protested the move by the Budget and Appropriations Committee to insert a clause which indicates that for anyone to benefit, that person should not engage in elective politics. The Bill provides pension and other retirement benefits to the persons who hold the offices of deputy president and designated state offices upon their ceasing to hold office. In 2012, then President Mwai Kibaki rejected a Bill that MPs passed allowing for provision of retirement benefits of deputy president and other designated state officers. Currently, there is no provision in law on how to provide for retirement benefits of the offices of the speakers and other state officers such as the Chief Justice. Mbadi pushed to include former VP Moody Awori and Chief Justice Willy Mutunga, who retires in three years. The Bill proposes that the government gives a lumpsum payment on retirement to speakers at the end of their term. This is a sum equal to one-and-a-half years’ salary paid for each term in office. The speakers will also be given a saloon car of not more than 2,000cc and a four-wheel-drive of not more than 3,000cc. It is imperative to note that a section of MPs from the Jubilee side have not been comfortable with the Bill arguing that Odinga and Kalonzo are yet to retire and have publicly declared interest to vie again. It is however doubtful that Kalonzo would make an impact as either presidential candidate or running mate given his loosening grip of Kambas. Although his main nemesis since Moi days Charity Ngilu is a cabinet secretary under Uhuru, the emergence of young and vibrant MPs pushing for his exit from politics is giving the Tseikuru- born politician sleepless nights. The MPs, Francis Mwangangi, Vincent Musyoka, Benson Mbai, Victor Munyaka and John Munuve want Kalonzo have not been giving Kalonzo the breathing space. Although the MPs such as Mwangangi and Munyaka had been Kalonzo diehard defenders in the runup to the last elections, they were denied the Wiper nomination ticket after trouncing Kalonzo’s preferred men Charles Kilonzo and Urban Mutisya respectively only to defect and repeat the fete in polls proper. Mwangangi ran on Muungano and Munyaka on CCU. Mbai was also denied the ticket after thrashing Kalonzo’s favourite. He jumped ship to Ford P and carried the day. Others like Musyoka of CCU have never had anything to do with Wiper. It is against this background that it is seen as delusional Kalonzo’s now tired refrain that MPs now criticising him rode to power using his name. Those who Kalonzo well however say that he is bitter that the MPs beat him to Jubilee as he would have wanted to be the one to herd the community back to government. Mwangangi who is the most prominent Jubilee pointman in Ukambani told Kalonzo the community stands to benefit in government and had sometimes back been urging Kalonzo to join Uhuru and had even started modalities for the community to make a formal request on Uhuru to invite Kalonzo to government only for Kalonzo to chastise him fiercely on return from a trip to China where he is again. Kalonzo who joined Raila in the last minutes before 2013 general elections is finding himself in unfamiliar political waters, namely the opposition, since his entry in parliament in a 1985 by-election. The by-elections was occasioned by the death of the popular Kitui North MP Philip Manandu who was shot dead by a rogue Administration Police officer. For nearly three decades, Kalonzo enjoyed trappings of power rising from deputy speaker, assistant minister, minister and Kanu’s national organising secretary. He enjoyed political pupilage under the powerful Kanu supremo, Mulu Mutisya until his demise when he took over the leadership mantle of the community. It seems things have gone full circle for the one-time Kanu hawk. His political career is facing the severest challenges from leaders who are now calling on him to pass the baton to young leaders. Of late, Kalonzo has suffered humiliation after his effort to stop the impeachment of Machakos deputy governor Benard Kiala failed. Nominated MCAs from his Wiper party ignored him and went ahead to impeach the Wiper deputy governor only to be saved by senate. From China where he is currently, the former VP will have to contend with the happenings at Makueni county where Governor Kivutha Kibwana is facing impeachment threats from majority MCAs also drawn from Wiper. Even lowly factotums like Machakos MCAs led by minority leader Tom Kasoa were bold enough to dismiss the once-powerful Kalonzo when he castigated them on Kiala’s impeachment. Machakos Town MP Munyaka who is now allied to Jubilee also has told Kalonzo to read the writing on the wall lest he ends up irrelevant sooner rather than later. When Uhuru visited Kitui, he was noncommittal on leaders’ pleas to have the Kibwezi-Kitui-Maua road tarmarcked and it has been whispered that this is the trumpcard Uhuru is waiting to snare Kalonzo with as he will tell Kambas part of the goodies he will give Kambas if Kalonzo agrees to be in government is construction of the road. Word has it that should Kalonzo refuse to deal, Uhuru and William Ruto will groom a new crop of principals in the region to check Kalonzo whom they believe is too much a prisoner of Machakos senator Johnson Muthama. Kalonzo reluctantly joined Raila after being egged by Muthama and there are those who say that his heart is still in Jubilee where Muthama plucked him and bragged that he would throw Kalonzo into Raila’s camp the way one pushes cattle into the dip. Muthama would later joke that the misgivings Kalonzo was expressing in the Raila camp were the discomfort cattle feel when the pesticide comes into contact with the wounds on their skin falling ticks leave. Incidentally, Muthama is also said to be trying to meet Uhuru to strike a deal that would see him bring Kalonzo and Kambas to Jubilee. Although he is doing this using the name of Kalonzo, the former VP has reportedly made it clear to State House that he has a mouth of his own and that Muthama is out to mortgage the community for his personal gains. 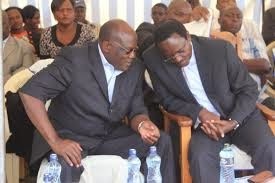 It is said Kalonzo is aware that Muthama is using the political negotiation to have his fraud cases terminated. Others say Kalonzo is wary of deals struck by Muthama because at the end he receives only a fraction of the finances Muthama is send to take to him. 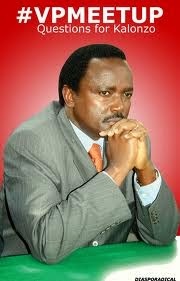 That Kalonzo is feeling it out of power is in no doubt. Last week, he reportedly initiated a court process to withdraw his party’s support to its nominated MP Bishop Robert Mutemi with a view to ejecting him and then taking over the position in parliament himself. Mutemi who is physically challenged represents the disabled and at one time when Kalonzo showed interest on his seat, he told Kalonzo to have a leg cut so that he fits the bill.